VICTORIA, BC – Like many breweries across the country, Phillips Brewing is releasing something summery for the upcoming Victoria Day long weekend. 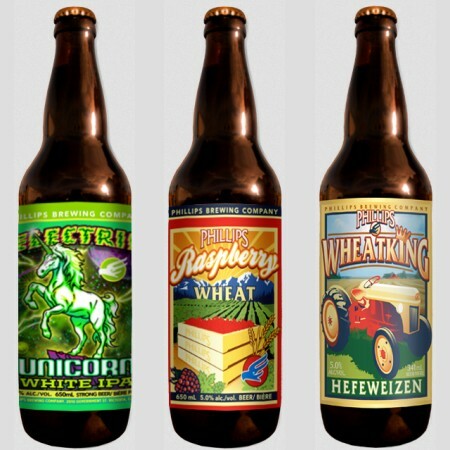 But rather than just one beer, Phillips has three warm weather brews to offer, all of them made with wheat. Brewed with a generous portion of wheat, hops from the West combine with coriander and a mystical yeast inspired from the East–from Belgium to be specific–to produce a taste that’s well balanced and features plenty of Belgian-fruit character. Ditch reality and take this India pale fairy tale for a ride. Brewed as dry, crisp wheat ale, fresh raspberry puree is added at the end of fermentation allowing fruit sweetness to permeate the beer without overpowering the delicate wheat characteristics. This summer staple pours a deep red colour with a bubblegum pink head, and is as synonymous to summer as sunshine. Brewed with our signature weizen yeast, Wheatking is unfiltered and pours a cloudy golden straw colour with a pillow white head. So put a pillow under your head, find a hammock somewhere and pair a little hazy with a little lazy. Electric Unicorn and Raspberry Wheat will be available in 650 ml bottles, and Wheatking in six-packs of 341 ml bottles, at the Phillips brewery store and in select private liquor stores in BC. All three beers will also be available to taste during a drop-in event at the Phillips brewery this Thursday May 16th from 4:00 to 6:00 PM.